All drone parts and components are vital to a smooth and safe flight. Knowing the parts of a drone will give you extra confidence while flying. You will also know which components to inspect on a regular basis and the drone parts which are easy to replace or upgrade. If you have any flight problems, then knowing what each drone component does will assist you greatly in getting to the bottom of any flying issues. This article will provide you with a great overview of all the drone parts and components which you will find on a modern day consumer and professional drone. 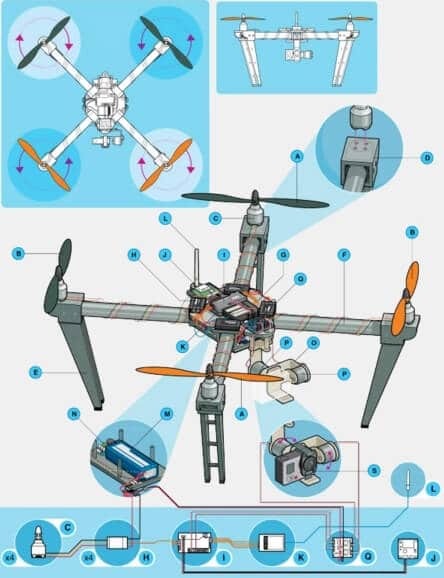 The excellent diagram of the drone components and the listing of drone component parts comes from an article called anatomy of a drone by MakeZine. I have added extra information and explanations along with tips for each UAV component. At the end of this article, I have 2 terrific videos. The 1st shows you very briefly the drone components and the 2nd video shows you how to build a racing quadcopter along with all the drone components required. Dont’ forget to pop over to our DroneZon parts website where you can find upgrades parts and accessories for DJI, Yuneec, Walkera and Parrot drones along with FPV equipment. The “tractor” propeller are the props at the front of the quadcopter. These props pull the quadcopter through the air like a tractor. While some drones like the DJI Phantom look more or less the same from any angle, there is a front and back. Most drone propellers are made of plastic and the better quality made of carbon fiber. For safety, you can also add drone prop guards which you need especially if you are flying indoors or near people. Propeller design is an area where there is plenty of new innovation. Better prop design will assist in a smoother flying experience and longer flight times. There is also some big innovation towards low noise uav props. Tip: It is always good practice to inspect your props before flying and carry an extra set in case you notice some damage on a prop. Never fly with a damaged or bent prop. The Pusher props are at the back and push the UAV forward hence the name “Pusher props”. These contra-rotating props exactly cancel out motor torques during stationary level flight. Opposite pitch gives downdraft. These can be made of plastic with the better pusher props made from carbon fiber. You can also purchase guards for the pusher props. Tip: Same as for tractor props. Inspect before each flight and carry a spare set. Practically all the latest drones use a brushless electric “out-runner” type, which is more efficient, more reliable, and quieter than a brushed motor. Motor design is important. More efficient motors save battery life and give the owner more flying time, which is what every pilot wants. Drone motor design is pretty exciting at the moment. The top of the range DJI Inspire 1 released earlier this year are a new patented design. DJI developed and patented a new curved magnet which fits perfectly around the motor allowing the motor to run more efficiently. Tip: Examine the motors regularly. Make sure they are clean and free from dust. Get to know how your drone sounds. Listen to it. Most of the sound comes from the motors. If it doesn’t sound right, then examine your drone. Fly a couple of feet off the ground and close to you. Look to see if one of the motors is failing. It’s not a bad option to have a spare motor or 2. Tip: If you are building a drone from scratch, see the video at the end of this article. Read this article on how a quadcopter works and flies. This article shows you how a quadcopter flies in any direction by adjusting its motor / propeller direction and speed. 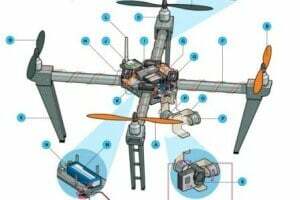 It covers quadcopter motor and propeller configuration and design with some tremendous videos also. The drone motor mount is sometimes built into the combination fittings with landing struts or can be part of the UAV frame. Their are quite a few parts which are easy to replace on most drones. Watch how easy it is to replace the Parrot AR motor here. You will also notice that the motor mount is part of the central cross of the Parrot AR. Tip: Check the motor mounts and areas close to the motors for stress cracks. If you find stress cracks and your quadcopter is under warranty, then you can send it back and have it fixed. Alternatively the manufacturer may have some strengthener motor mounts. Tip: When you first receive your new drone, it is also a good to examine areas around the motor mounts or where screws are used. Sometimes, screws can be wound in too tight and actually can crack the frame. It may be just just a hairline crack but these won’t fix themselves. Drones, which need high ground clearance may adopt helicopter style skids mounted directly to the body, while other drones which have no hanging payload may omit landing gear altogether. Many fixed wing drones which cover large distances such as the SenseFly eBee, Trimble UX5 or the 3DR Aero-M don’t have landing gear and land perfectly fine on their belly. Most drone has a fixed landing gear. However, the best drones will have retractable landing gear giving a full 360 degree view when in the air. Tip: For most of the latest drones you can buy leg height extenders. If you are flying in areas where there is long grass, then it is a great idea to have a big landing mat. Tip: Examine your landing gear and especially if you’ve had a bit of a rough landing. This protects the drone, expensive camera or sensors. Tip: If you can and it suits your needs, buy a drone which has retractable landing gear. Then you don’t have to worry about the legs getting in the way of a great photo or video shot. With retractable landing gear, keep it clean and free from dust and dirt. In that way the landing gear doesn’t seize up. Shorter booms increase maneuverability, while longer booms increase stability. Booms must be tough to hold up in a crash, while interfering with prop downdraft as little as possible. In many drones, the boom is part of the main body. Other drone have a definite boom as a separate part. The Parrot AR 2.0 has the central cross boom. Tip: Examine and insure that the boom has not become bent as this would effect the flying capabilities. This is the central hub from which booms radiate like spokes on a wheel. It houses battery, main boards, processors avionics, cameras, and sensors. Tip: Most drones are not waterproof so it is vital that the internal components of the main body do not get wet. A hard landing may not break the body of the drone but the shock could damage the internal drone components in the main body. Tip: If you are not familiar with electronic engineering and soldering, then it is best not to learn on your internal components such as the main board in your drone. More than likely soldering something inside your main body will void your warranty. A warranty generally covers the UAV as it left the factory. However, if you know how to solder, then you can make some very good improvements to your drone. Here a handy video with some great soldering tips. An electronic speed controller or ESC is an electronic circuit with the purpose to vary an electric motor’s speed, its direction and possibly also to act as a dynamic brake. 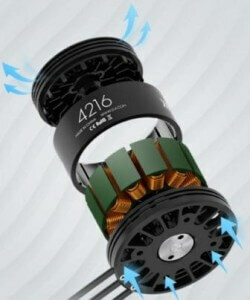 It converts DC battery power into 3-phase AC for driving brushless motors. Electronic Speed Controllers are an essential component of modern quadcopters (and all multirotors) which offer high power, high frequency, high resolution 3-phase AC power to the motors in an extremely compact miniature package. A massive leap in ESC innovation came on the DJI Inspire 1, which uses new sinusoidal drive electronic speed controllers to replace the more square wave drive of traditional ESCs. The Inspire 1 goes further by using closed loop torque control and distinct functional redundancy, which adds extra efficiency and reliability to the motors. Tip: The ESC are inside the main frame of the drone and most drone owners won’t need to do anything with these. However, companies such as DJI, Yuneec and Parrot develop drones which can be customized. If you want to customize a drone, then it possible if the manufacturer has Special Development Kit (SDK) for that model. With the SDK, then you could re-program the electronic speed controllers and many other drone components. The flight controller interprets input from receiver, GPS module, battery monitor, IMU and other onboard sensors. It regulates motor speeds, via ESCs, to provide steering, as well as triggering cameras or other payloads. It controls autopilot, waypoints, follow me, failsafe and many other autonomous functions. The flight controller is central to the whole functioning of your UAV. Tip: Most owner won’t need to do anything or modify the flight controller by reprogramming. If you needed to create a customized solution then a drone with SDK as mentioned about would allow this. The GPS module often combines GPS receiver and magnetometer to provide latitude, longitude, elevation, and compass heading from a single device. GPS is an important requirement for waypoint navigation and many other autonomous flight modes. Without GPS, drones would have very limited uses. Along with FPV, drones can navigate long distances and be used for exciting applications such as creating 3D images using lidar and photogrammetry sensors. GPS stands for Global Positioning System. It is an American standard which provides location and time information in all weather conditions, anywhere on or near the Earth where there is an unobstructed line of sight to four or more GPS satellites. Some of the latest drones have added Glonass, which is the Russian equivalent of GPS. This means your drone is almost guaranteed to find many more satellites to get its positioning from. With both systems, you can fly more accurately and also can fly safer as you know you won’t loose satellite connection. Tip: Most drones allow you to program in a failsafe home point. This allows the drone to fly back to a point if it loses connection to your remote controller. Most drones have a minimum requirement of satellites before the home point can be set. But always set a home point. When buying a drone, keep an eye out for drones which come with both GPS and Glonass. Often a standard r/c radio receiver unit. The minimum number of channels needed to control a quad is 4, but 5 is usually recommended. There are many manufacturers of receivers on the market if you are building your own drone. Depending on your receiver, it may be a loose wire whip or helical “rubber ducky” type. Tip: Antenna are pretty easy to upgrade. Circularly polarized cloverleaf antenna give you further video signal distance and improves the video stability. A very good antenna stops the problem of the multi-path effect and also blind angle. If you would like to understand the technology behind first person view and video transmission on drones, then read this terrific article entitled “Understanding FPV Live Video And Antenna Range“. Tip: It’s always great to carry a spare battery or 2. Read and follow the instructions for charging and storing your battery to make sure it lasts a long time. Every so often is always good to fully discharge and recharge your battery. Check to make sure your battery doesn’t overheat. All batteries are dangerous when are physically damaged so never install a damaged battery into your drone. Also never try to recharge a battery that has physical damage. 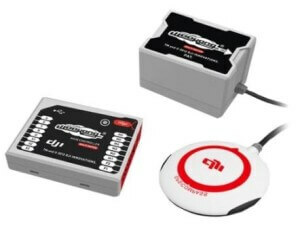 Provides in-flight power level monitoring to flight controller. Your battery is critical to flying safely. If you fly too far out and your quadcopter runs out of battery then it will either make an emergency landing or will crash. Tip: Know your drone’s flying time, battery levels and where to read these levels. Don’t push the boundaries of flying on low battery power. The drone gimbal is the pivoting mount, which rotates about the x, y, and z axes to provide stabilization and pointing of cameras or other sensors. Tip: If you don’t have a great gimbal, then it doesn’t matter how good the camera is. The gimbal is all important for taking great photo and video shots. With the wrong gimbal and camera on your drone, you will never be able to take professional videos or photos. Some of the problems are rolling shutter, jello and barrel effect. Tip: If you are having problem with jello effect, which is caused by vibration from the drone getting to the camera, then look at installing or changing the gimbal dampers. This can make a big difference. Brushless DC motors can be used for direct drive angular positioning, which require specially-wound coils and dedicated control circuitry which have only recently become commercially available. Allows control of direct-drive brushless gimbal motors as if they were standard servo motors. GoPro or other compact high definition video unit with on-board storage. Real-time streaming is possible on the latest drones such as the DJI Mavic 2 Pro and Zoom. Other drones which can live stream are the DJI Mavic Air, Spark, Mavic Pro, the Phantom 4 Pro and the top professional Inspire 2 filming quadcopter. Many drone manufacturers produce gimbals which are compatible with the GoPro Hero camera range. GoPro brought out their own Karma drone but it has since been discontinued as of January 2018. The latest drones are all in one, which come with an integrated gimbal and camera. These cameras and lens are specifically designed for aerial filming and photography. DJI who are the largest manufacturer of UAVs take their camera and gimbal technology extremely serious. 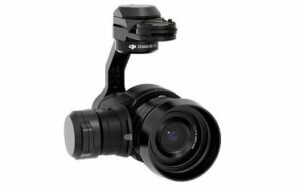 In June 2017, DJI and Hasselblad, the leader in high-quality professional medium format cameras introduced the first 100-megapixel drone imaging platform. Tip: Buy the best you can afford. Look for drones with integrated gimbal and camera which means you’re buying a proven and tested system. Tip: You can use software to remove fisheye for your aerial photos. Drone are more than just for aerial filming and photography. We are now seeing lidar, thermal and many other types of sensors being mounted onto drones and being used in a wide variety of sectors. The mounted camera along with the GPS can be used to create accurate 3D photogrammetry images. 3D mapping, also known as photogrammetry mapping is the science of making measurements from photographs. The output from photogrammetry software is typically a 3D map, a 3D drawing or a 3D model of some real world object or land mass. By flying a mapped route and taking photos at regular intervals of say every 1 second, these images are then stitched together to create 3D photogrammetry images. To create 3D maps or models, all you need is a top drone with camera and GPS. The drone will capture the images and any of these top photogrammetry software applications will stitch the photos into 3D maps or models. 3D maps are generally quite large and take a lot of processing. Many of the 3D mapping software companies can process the images in the cloud and also store the images for you. Drones today can come with 2 types of sensors. The above for creating 3D images of the external world by using Lidar and Thermal vision cameras. The 2nd type is on-board sensors for collision avoidance using Monocular Vision, Ultrasonic (Sonar), Infrared, lidar, Time-of-Flight (ToF) and Vision Sensors. That covers the vast majority of components you will find in your modern day drone. Next, I have 3 very interesting videos. The 1st and 2nd videos focus on the many components commonly found in model aircraft and breaks down how they all come together to function. The 3rd video shows you how to build a racing drone including the components to build your own drone. This next video shows you what is inside a DJI Phantom 3 drone which is still very popular even though the Phantom 4 is now on the market. This last video shows you how to build a nice FPV racing quadcopter.